Mornings are hard. I once worked in an office where I was the only one who drank coffee. That’s right, no coffee pot and no coffee shops or drive-thru’s nearby, just little packets of decaffeinated green tea taunting me from the break room. I would arrive every morning with my personal keg of coffee and quietly caffeinate in my corner cubicle while fresh-faced decaf coworkers buzzed around with irritating peppiness. We’ll go to ridiculous lengths to make mornings as easy as possible: breakfast prepped, coffee timer set, clothes laid out. Many of us just aren’t morning people. I don’t know what I would do without my coffee. 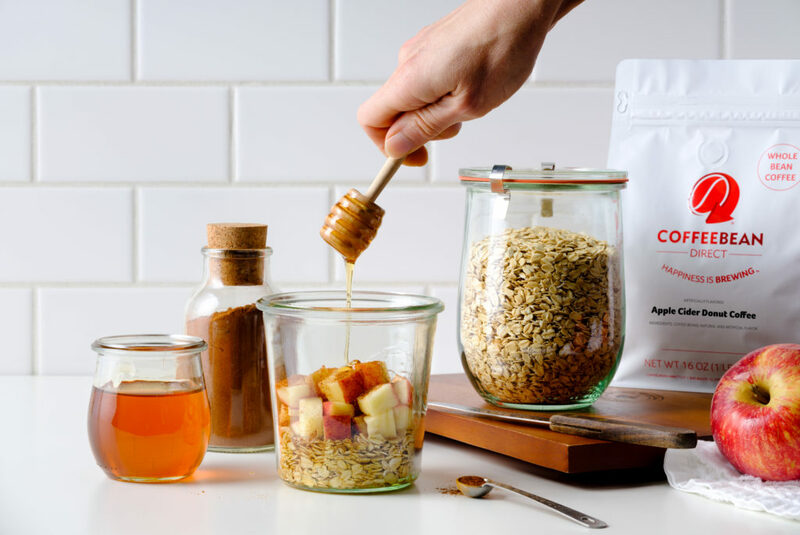 Seeking to minimize my morning routine, my interest was piqued when I came across a recipe for “overnight oats with coffee.” Coffee and breakfast in one? It was almost too good to be true. I looked for a simple overnight oats recipe and added in my own dash of pizzazz. With fall comes a plethora of rich, hearty flavors too good to pass up. As much of a summer person as I am, I must admit, I’ll take a dash of apple cinnamon or pumpkin spice in my coffee any day. One of my favorites is our Apple Cider Donut flavored coffee. Fusing the flavors of fresh donuts (without the guilt, might I add), spicy apple cider, sweet brown sugar, and cinnamon, this autumnal flavor pairs perfectly with breakfast. I decided to give it a whirl in my overnight oats recipe. This recipe called for ¼ cup of coffee, strong brewed. I made mine double strength and let it chill. As much as you may want to sleep in, kids and pets often have different ideas. Often, it’s even hard to find much time for meal prep in the evenings. I liked this recipe because it was easy and didn’t require a lot of ingredients. In a jar, I mixed ½ cup of chopped apple, ½ cup of old fashioned oats, a teaspoon of honey, an 1/8 teaspoon of ground cinnamon and chilled coffee. Then, I sealed it up and hoped for the best. It made me a little nervous forgoing the timer on my coffee pot, but I was committed to finding out if my coffee oats would do the job! I couldn’t believe how tasty this recipe turned out to be. A breakfast that is filling, easy, and gets me going in the morning? If only I had known years back, I could’ve saved myself a lot of sulky mornings in that corner cubicle. Well, better late than never! Give this recipe a try or modify it to your liking. Pumpkin Spice coffee overnight oats? Mash in a banana? Overnight oats with yogurt? Tell us what you think in the comments below! This entry was posted on Monday, October 8th, 2018 at 9:17 am	and is filed under Recipes. You can follow any responses to this entry through the RSS 2.0 feed. You can skip to the end and leave a response. Pinging is currently not allowed.